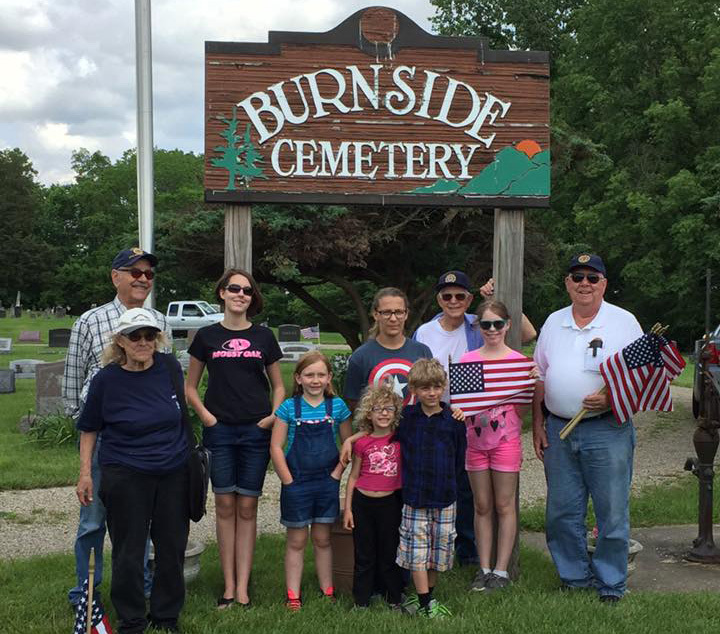 Veterans Graves Marked May 28, 2017. . . .
Sunbury Halter and Saddle 4-H Club Members, their Parents, and American Legion Post #457 and the Big Walnut Area Historical Society replaced flags and holders as needed then read about each veteran as printed below. Bussey, Private Ronald Roy, 1948-2008. Enlisted March 19, 1968; Served in the U S Army in Vietnam; Released March 12, 1970. Cook, Ronald Lee. Born April 20,1939, in Urbana, Ohio. Enlisted April 10, 1959, in US Army. Released March 31. 1965. Died August 4, 2001 in Delaware County. U.S. Army. Hakes, Boyd Kendall, 1946-2014. Served in the U. S Marine Corps during Vietnam War. Lyle, Gary Michael, 1948-1984. Enlisted in the U. S. Army on May 24, 1968; Served in Vietnam; Released on May 22, 1970. McNeal, SSG James Richard, 1936-2008. Enlisted in the U. S. Army on June 23, 1964; Served in Vietnam; Released on November 22, 1968. Miller, SP5 Robert Ernest. Born Jan. 13, 1950. Enlisted in US Army on August 29, 1969. Released July 29, 1971. Died 12-3-2001. U.S. Army, Vietnam. Oosterbaan, Duwayne Dale. Born Sept. 23, 1942, died Nov. 20, 2010. U.S. Air Force in Vietnam. 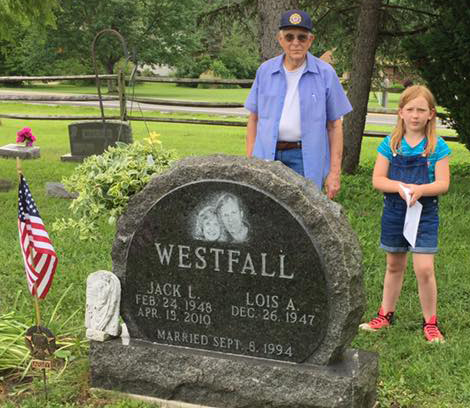 Westfall, Jack C., Born February 24,1948. Served in U.S. Army in Vietnam Conflict. Died April 13, 2010.